Enjoy this Adventure: Relax, Look and let yourself go. came to venerate Ixchel, the goddess of the moon, fertility and childbirth. Isla Mujeres is not a product of the imagination, it is a dream come true. Tax for use of dock and Conservation of Marine Park: $ 13.00 USD per person, adults and minors. We recommend you take cash, to buy souvenirs. Do not carry heavy packs or backpacks. 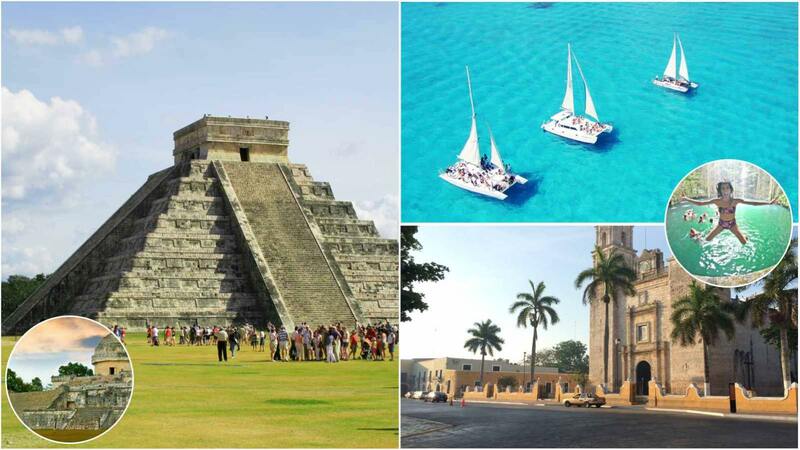 Consider bringing a light sweater or something to cover during the trip to Chichen Itza. Wearing tennis shoes or sandals with mooring for the tour in Chichén Itzá. Do not forget your camera (do not bring tripod, its use in the archaeological zone is not allowed). Our buffet-style meal includes: Salads bar, (chicken, fajitas, fish), rice, pasta, mashed potatoes, steamed vegetables, beans and fruits. The open bar includes: Tequila, rum, vodka, beers, soft drinks, juice and water. We take care of protecting marine life, so we ask you to bring biodegradable sunblock. Bring sunglasses, swimsuit, sandals, hat, towel and a change of additional clothes. The snorkeling tour and the flight in Spinnaker depend on the weather conditions. The pier and reef tax must be paid in cash when boarding the catamaran directly at the dock. This payment is taken to protect and maintain the marine park and marine life of the coral reefs throughout this area. Do not forget to bring your aquatic camera, you will need it. The Adventure is in Isla Mujeres, Live it to Believe it! $ 120.00 Juniors 3 - 9 Years.